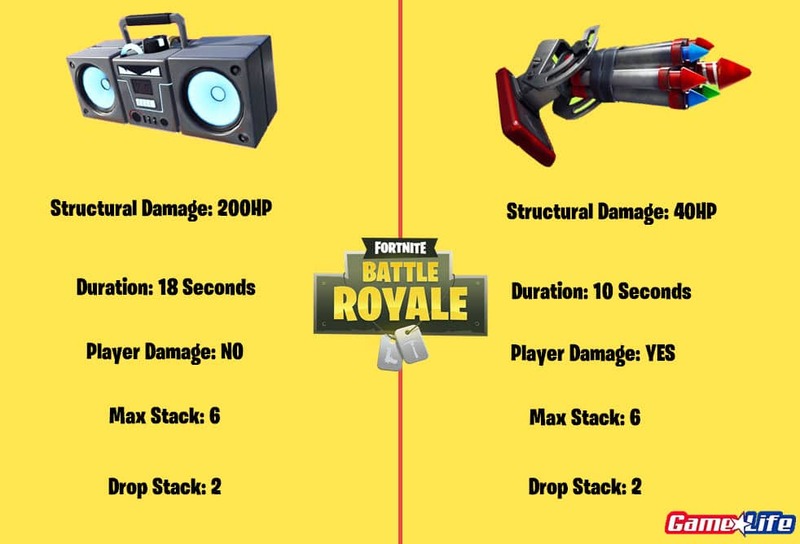 Fortnite Bottle Rockets are a weaker version of Boomboxes as they are both compared side by side, did Epic make the right decision including Bottle Rockets? With the second V7.30 Fortnite update, Epic decides to vault the controversial Boombox while introducing the Bottle Rocket. Although both items primary use is, damage to structures, bottle rockets also inflict player damage. Bottle Rockets are essentially a nerfed version of the boom box. The major complaint regarding boom boxes was the speed and radius of its damage. This was the main factor for the item being vaulted with the last 7.30 content update. However, Bottle Rockets step in to take it’s place with much less power. However, the Bottle Rocket is the first Fortnite weapon that can attach to moving vehicles such as planes and quads. Here is a breakdown comparing both items. Even though the Bottle Rocket does inflict an impressive 10HP player damage, it’s speed is slow. Because of its much lower structural damage, players can escape the rockets taking limited damage. In the case of boombox speed, structures are immediately destroyed with no time to build up to escape. The vaulting of boomboxes is surprising due to the fact that redeploy is now back in BR. Here is video comparison of structural damage from both the boombox and Bottle Rocket. It is very clear how ineffective the bottle rocket is when targeting metal structures. It’s range does not spread very much comparing the boombox which has a 2-3 tile radius. The results with metal structures clearly show how ineffective the bottle rocket is with it 40hp damage. 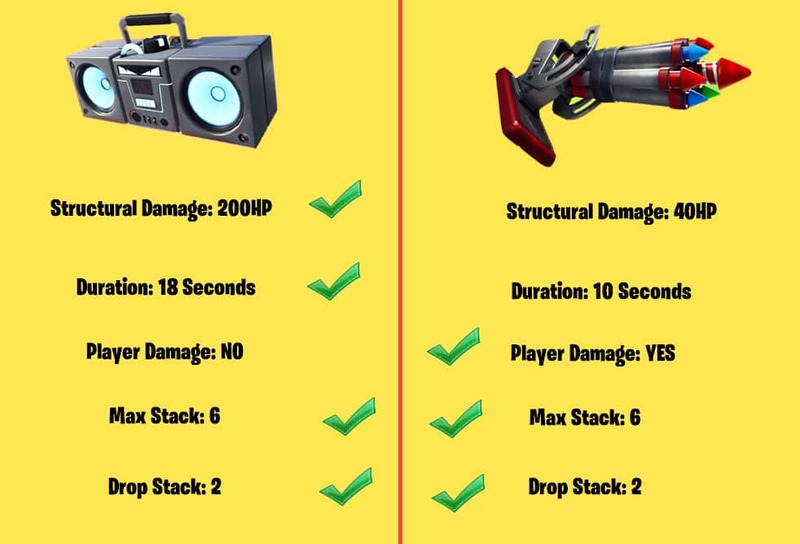 It is without a doubt that the Fortnite fan base deemed the boombox as an “Annoying Item”. Although the item was nerfed during the first v7.30 update, it did not save it from hitting the shelf less then a month after being added to the game. As for the Bottle Rockets, it has not been confirmed, if it was added only because of the Chinese New Year. The first version of it is pretty dull but it does have potential with certain tweaks to its range and damage.